Some 12 to 20 percent of dogs suffer from allergy-induced skin problems. Selsun Blue contains selenium sulfide, which functions as a drying and degreasing agent. 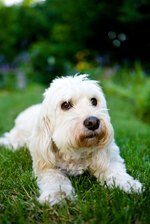 Many veterinarians prescribe the shampoo for treatment of Malassezia pachydermatis, a yeast commonly found on dogs. Some dogs suffer an overproduction of the yeast from allergies or other immune problems. This yeast leads to itchy skin, pustules and hair loss. Selsun Blue can help control that. 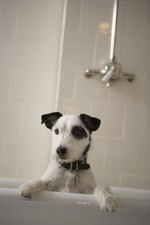 Place the dog into a sink, tub or shower. Adjust the water so it is not too hot and not too cold. Use a handheld spray nozzle attached to the faucet or use a large cup to scoop water over your dog. Wet the dog from head to toe. Work the water into the fur using your fingers. Apply a quarter-sized amount of shampoo to the dog's rump, between its shoulders, on its chest and on either side of its rib cage. Massage the shampoo into the fur. If the dog's skin is irritated, be gentle. Avoid getting shampoo in the dog's eyes and ears. Leave the shampoo on the fur and infected areas for two to three minutes, then rinse thoroughly. Pat the dog dry with a towel. Blow-dry the dog if you have a dog-approved blow dryer that blows cool air. Bathe the dog every other day until the skin condition begins to clear up. Watch the dog's skin condition closely to ensure there is improvement. If the condition worsens, discontinue use of the shampoo and consult a veterinarian immediately.